We stayed in Villa Abyss for two weeks. The service was excellent from the moment we arrived and were met by the owner who gave us lots of suggestions for days out and places to eat. The villa was beautifully cleaned all the time, fresh towels and bedding twice a week too. The villa is lovely and modern, everything in good condition and stylish - top notch quality. There is a dishwasher, full size fridge and freezer, washing machine, cooker and microwave. There is even a juicer and sandwich toaster and we made use of the BBQ. There is an iphone/ipad music dock as well as a TV with just a few channels on. The wifi was reliable, but a bit slow - fine for emails, internet and music streaming but not for big downloads such as films. I did struggle to use the corkscrew, and pair of scissors would be useful to take. The villa is two separate buildings. In one the sitting room and kitchen, with a toilet/shower in this building. The bedroom building has a safe and another bathroom - a Jacuzzi bath and hand held shower attachment. There is facility to sleep in the sitting room making this a three person villa, but to be honest given the layout and the size of the villa, it is really only suitable for two people for any length of time as one of the consequences of a modern funky interior is lack of storage space. The outside space is lovely. The pool was a good size and regularly cleaned, the place really was kept spotless. There is a lovely seating area overlooking the bay below. You are up on a hillside so take a cardigan for the odd windy evening, even in July! There are other villas so you do not feel you are totally away from it all, but they are situated so you are not particularly overlooked and all the villas are up a track a few 100m away from the road. It was quiet and quite rural - yet with great access to the main coastal road from where you can drive to anywhere (you do need a car). Just up the road is a mini market and bakery. Kissamos is only a five minute drive away where there is quite a large Carrefour so we didn't struggle to get anything we needed. There are also some nice restaurants where the owners were lovely and welcoming. Try The Cellar on the sea front. Drive towards Falassarna and go to Spilios (10 mins) as well as The Gramboussa in Kaliviani (10 mins). Chania is 40 mins away, ask about the best place to park and recommendations from the owner. A lovely set of villas, beautifully kept, nothing is too much trouble, location is convenient with plenty to do, yet not in an area that is too touristy. Would highly recommend. Youphoria is truly paradise. It is set on a hill among olive trees with a view to die for. The villas are beautiful. The pictures on the website are exactly what you get. If you want privacy this is your place. The nearest town is only a few miles away. Vasillas the owner is only a phone call away if you need anything. I like youphoria so much I was thinking about asking vassillis if he would sell abyss . Vassilliss I will see you next year. Abbiamo soggiornato in qui le prime due settimane di agosto del 2012. La villa è più bella e affascinante che non in foto (incredibile), semplicemente perfetta, curata in ogni particolare. Il servizio è eccellente, il proprietario sempre disponibile e cortese. La vista sul mare è incantevole, il silenzio perfetto e si è vicini (in auto) alle tre più belle spiagge di creta, anche se la villa è così perfetta che si fa fatica a lasciarla anche solo per andare in spiaggia! Grazie ancora Vassilis per la splendida vacanza. 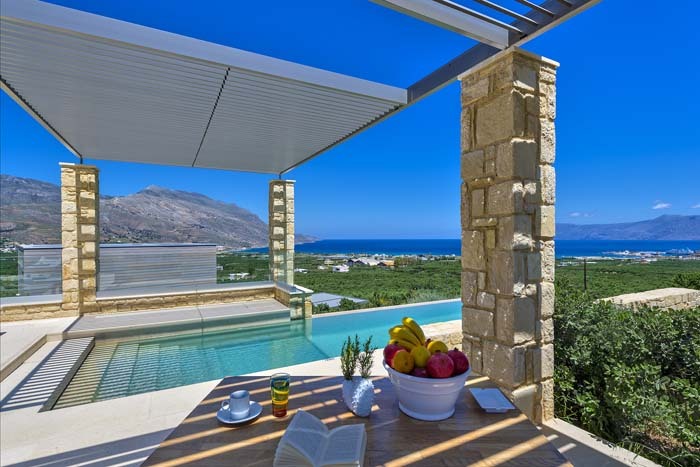 After a long search for a special holiday accommodation on Crete, we finally found Youphoria Villa’s via the website of homeaway and we decided to rent villa Abbys early July 2012. The villa and location exceeded our expectations. On our arrival, we were welcomed by Vassilis, the owner of the Villas, who showed us around on the premises and familiarized us with the high tech villa. Our villa consisted of two connected buildings, with in one part the modern kitchen, separate bathroom with shower, living room and direct access to the private infinity pool and lounge terrace. The other building housed the bedroom and a large en-suite design bathroom with Jacuzzi. The villas are located on a hill near the village of Kissamos, and offer a wonderful view over the bay. There are around 6 villas on the property, but the good thing is that they are located in such a way that you don´t feel like being on a holiday resort, but have the privacy of your own private villa. The location is perfect to discover the unspoiled beaches and nature the Western part of Crete has to offer, but is at the same time not far away from the more touristy villages like Platanias. I strongly recommend Youporia villa’s to anyone who is looking for luxury and design in a beautiful relaxed setting.